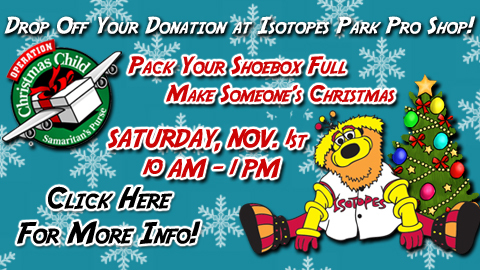 Albuquerque Isotopes fans are invited to join Orbit Saturday, November 1st at the Isotopes Park Pro Shop from 10 a.m. until 1 p.m. as the Isotopes will be hosting an Operation Christmas Child toy drive, the world's largest Christmas project of its kind that uses gift-filled shoeboxes to share God's love in a tangible way with needy children around the world. Fans are encouraged to bring either a packed shoebox or "shoebox sized" toy (such as a stuffed animal) for donation to Operation Christmas Child. Gifts can include toys, school supplies, non-liquid hygiene items, accessories and a personal note. A $7 donation is needed to help cover the shipping cost for each box. Additional details on how to pack your shoebox can be found at samaritanspurse.org. "This is a great organization and a great event that is able to provide a little bit of Christmas to children around the world," said John Traub, General Manager of the Isotopes. "We are thrilled to be able to open our Pro Shop for a great cause like this and invite our fans to contribute." Orbit will be on hand to welcome guests and select prizes will be given away throughout the day. The Isotopes Pro Shop will open exclusively for this event from 10 a.m. until 1 p.m. Since 1993, Samaritan's Purse has collected and delivered more than 113 million gift-filled shoeboxes to children in over 150 countries through Operation Christmas Child. In 2014, Samaritan's Purse hopes to collect enough shoebox gifts to reach another 10 million children through the Operation Christmas Child project. Shoebox gifts are collected in the United States, Australia, Austria, Canada, Finland, Germany, Ireland, Japan, New Zealand, Spain, Switzerland, and the United Kingdom. More than 500,000 volunteers worldwide, with more than 100,000 of those in the United States, are involved in collecting, shipping, and distributing shoebox gifts.